Snowdrops in my own garden (2014). Always wishing for more! Snowdrops (galanthus) look innocent enough. They’re all variations on white and green and sometimes yellow, and in itself the small snowdrop flower isn’t much to get excited about. But given three months of gray winter and an idle gardener and the mind keeps coming back to these first little harbingers of spring. 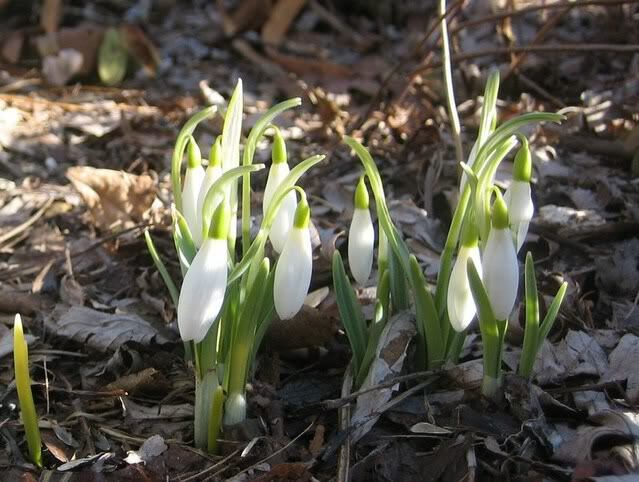 In June the little blooms would be lost amongst the explosion of color, but in February with no other outlet for that start-of-the-year gardening optimism, one’s spring fever sometimes turns to white fever, and that love of the genus galanthus can easily explode into full blown galanthomania. I’m there. I know there’s something wrong with me, my wife tells me there’s something wrong with me, and my internet browser history proves there’s something wrong with me, but I can’t stop. Being obsessed with snowdrops is hard enough (or maybe worse) on someone surrounded by snowdrop plantings and events, but here in the United States it’s a tough and lonely addiction. International law protects these plants from overexploitation in the wild and does so with costly and complicated import hurdles. As a result if you’re outside of their native Europe and the Balkans, indulging in the full range of snowdrops can be more challenging. To help other beginners face this challenge I thought I’d keep track of some of the most helpful links I found across the internet, and hopefully add a few more as people share. Although it’s not a specifically American resource, I’m afraid it will lean that way until someone invites me over to the other side of the Atlantic to erase my bias. A yellow snowdrop at The Temple Nursery, Hitch Lyman’s upstate NY garden. Snowdrop support groups Use your own discretion in joining or browsing these sites, they will surely make any white fever burn hotter. Snowdrops in American Gardens Facebook page. 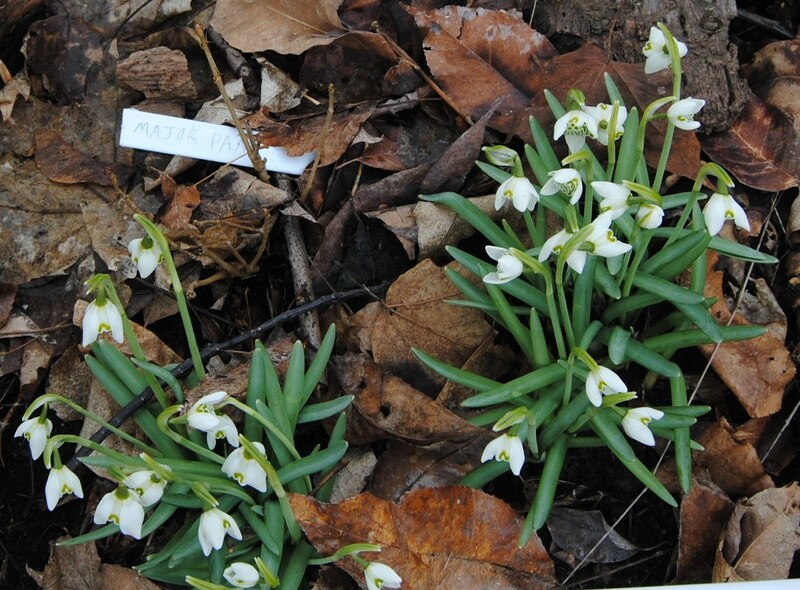 Keep up to date on the North American snowdrop scene with info sharing, sales, and sources. Snowdrops and Galanthophiles Facebook page. A global group for all things snowdrop! The Scottish Rock Garden Society’s Galanthus forum Probably the most dangerous English-language website for weak snowdroppers. You’ll want one of each, all the while exploring and learning from some of the most knowledgeable growers. My very own “Gerard Parker”, spring of 2014. The blog for Carolyn’s Shade Garden is not only a great collection of articles, it’s also listed as a source for many of the bulbs she writes about. Cold climate Gardening, some well written and informative snowdrop articles for Northern gardeners. 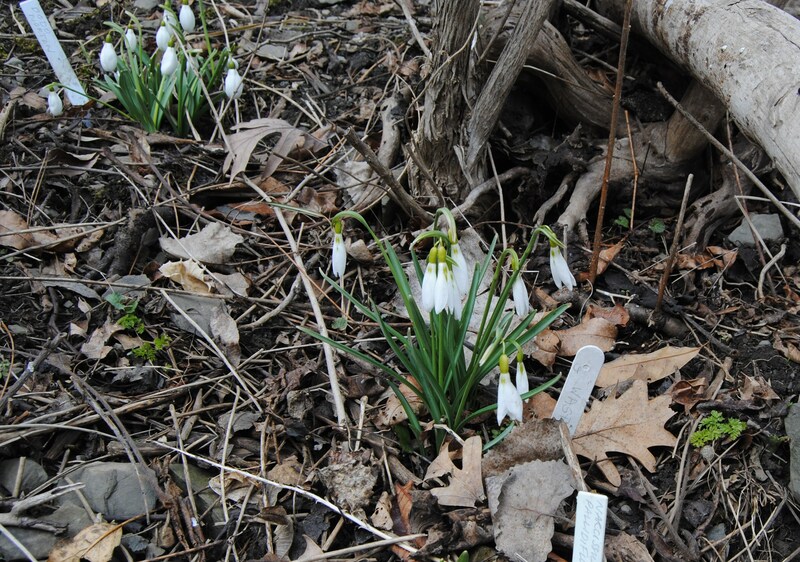 A classic NY Times article on Hitch Lyman, owner of the Temple Gardens and a snowdrop supplier. A Wall Street Journal article on David Culp, American Galanthophile (among other things of course!) and another article referring to David and others in Garden Design. 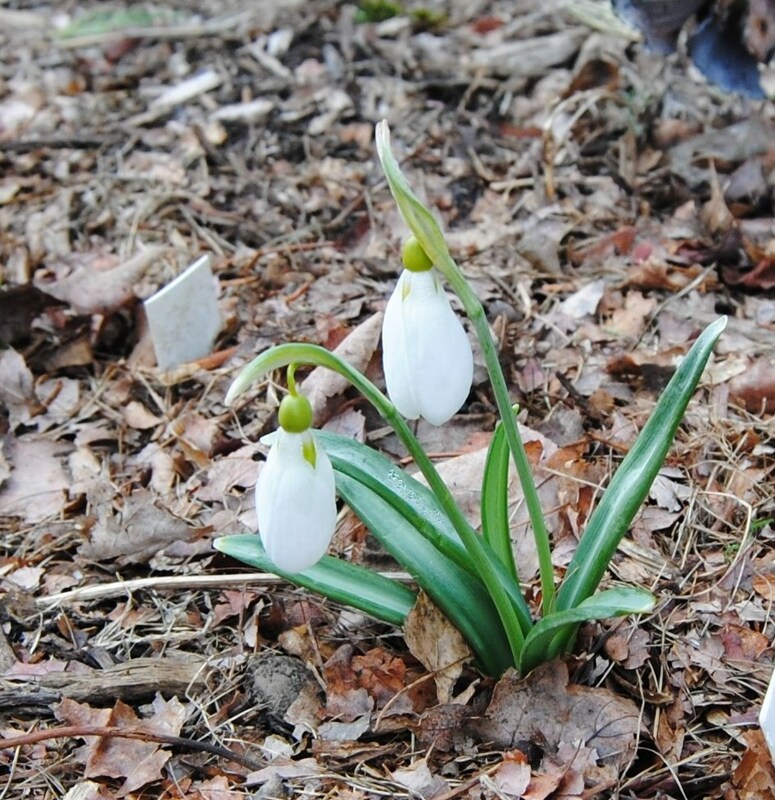 Washington Post article on snowdrops and snowdrop lovers. The snowdrop quiz via the UK’s Telegraph. How many do you recognize? Snowdrop stories from North Hill, the garden of Joe Eck and Wayne Winterrowd. Snowdrops are one of the few flowers willing to face winter head on. In warmer zones (7 and under) a range of snowdrops could be had in and out of bloom from October to April. Judy’s Snowdrops. Great closeups for a range of galanthus cultivars. 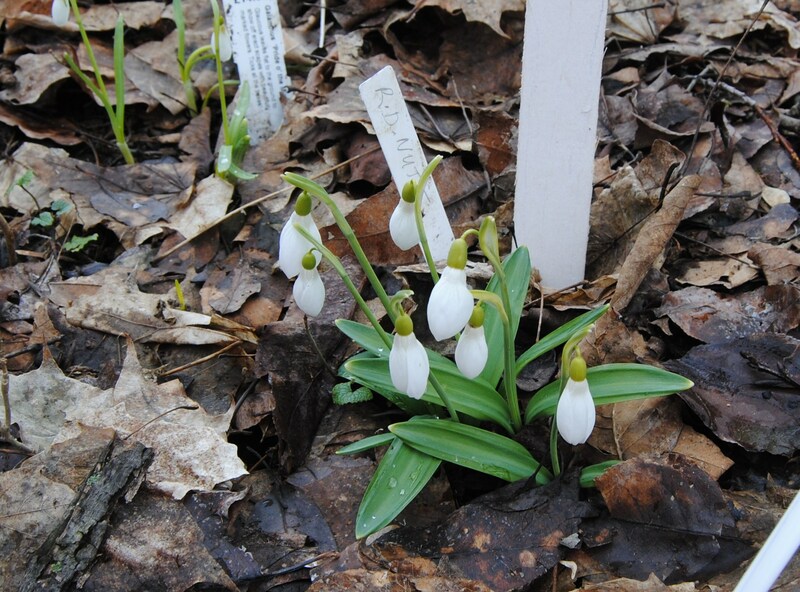 John Lonsdale is a Pennsylvania plantsman who has plenty of snowdrops growing at Edgewood Gardens. The website for Gerard Oud’s nursery. Pictures for a wide range of snowdrop cultivars. Just a plain old good read, Jearrard’s Herbal has a page devoted to the snowdrops he grows. It’s filled with a little history, a little growing advice, comments on the cultivar, and just about anything else that comes up. If your interests ever stray from galanthus there are plenty of other plants discussed so look around! Dryad Nursery has some beautiful photos of a range of galanthus cultivars. Make sure you don’t miss the photos of Anne’s ‘Wendy’s Gold’ seedlings, some rival the original! Avon Bulbs. Costly to order for out of EUers, but still a great reference for cultivar information. Galanthus Online. Ok so it’s in German, but try google translate since it’s a wealth of photos and info. This site was the online reference of the late Gunther Waldorf (lost to us in 2012) who did much to develop and promote snowdrops across Europe and beyond. His book is listed below. Last but not least there’s Revolution Snowdrops. I don’t know what to say exactly about Tom Mitchell’s Revolution Snowdrops website because it’s so much more than just a blog or article. It’s a resource, gallery, dreambook, and plain old adventure in snowdrops. Save this one for last, for the moment when adding new cultivars has gone beyond the obscure and you’re ready for a rainy day (or likely snowy) day eye opener for what the natural world still harbors in its unexamined yet ancient corners. Snowdrop books. Even with the wealth of information on the internet, nothing beats sitting down with a good snowdrop book. “The Snowdrop Bible” (aptly titled ‘Snowdrops’) is THE galanthus book. An in-depth reference by Matt Bishop, Aaron Davis, and John Grimshaw it covers most everything you would want from a book dedicated to these little white flowers. Published in 2006, the price can still run you into the hundreds of dollars but if you have some patience and keep checking prices, $85 is a possibility for the obsessed snowdrop lover. Other more budget-friendly books geared to the less obsessed gardener (with similar titles of course!) include books by Naomi Slade, Günter Waldorf, and Freda Cox. Get them all is what I say, so keep an eye on Amazon and check out Timber Press (for their 30% off sales) and you’ll have them soon enough. A final book I’m aware of is “Galanthomania” by Hanneke Van Dijk. It’s a book containing both Dutch text and an English translation and although it covers the usual galanthus advice it stands out for devoting a significant portion of the book to bios on some of the ‘names’ of the European snowdrop world. It’s nice to put a face and background to people such as Ruby Baker and Martin Baxendale. Galanthus “Wasp” with “Dodo Norton” in the back. Photographed at Hitch Lyman’s garden. Snowdrop sources – These are the US mailorder sources I’m aware of which offer less common snowdrop varieties. There are other sources which will ship to the US but check the import fees before you get too excited. When ordering snowdrops you’ll be buying either dormant dry bulbs, actively growing potted bulbs, or bareroot “in the green” bulbs either in bloom or just past. I’ve done all of them and have had excellent results regardless, my only failures have been with dry bulbs from Holland. The dry elwesii were no problem, but dry species nivalis and some of the more common nivalis types did not grow well or died the next year, even when the bulbs looked like they were in excellent shape when planting. I guess my point is that you of course should start slow and see what works best for you before diving in whole hog. The Temple Nursery. No web address, just send three or four dollars (I’m never sure if it’s a requirement or just common courtesy) to Temple Nursery (H Lyman) Box 591 Trumansburg, NY 14886 for a copy of his offerings. An artfully crafted catalog goes out in January and doesn’t take long to sell out, so request yours well in advance! Snowdrops are sent “in the green”. Edgewood Gardens 2017 was the first year John Lonsdale put together a dormant bulb list. He’s been selling all kinds of very special plants for years so to see him take the dive into snowdrops is exciting. Just send him an email at Edgewood Gardens and get onto the mailing list to see where this goes! Paula Squitiere. For those who’ve been to the Downington Pa snowdrop galas, you’ve likely run into Paula. She’s one of those snowdrop obsessed gardeners who has reached the point where her garden can no longer house the many drops she’s collected and has set up a table to offer the extras. Her troubles are your gain, and if you can’t make it to the gala to see what she has send her an email through pooter926@gmail dot com (of course replacing ‘dot’ with an actual .) and ask her what she has! Cornovium Snowdrops A UK source with an excellent track record for sending to the US. Because of import restrictions the process does add a bit to the price of your order, so check that out before getting too excited, but once you get beyond four or five drops the prices kind of balance out. Ernest Cavallo. For those who move within the circles of the North American Rock Garden Society there’s a good chance you’ve already met Ernie, heard one of his talks, or ordered from his dormant bulb list. For those who’ve not yet had that privilege drop him an email via ernestcavallo@aol dot com (of course replacing ‘dot’ with an actual .) and ask that he add your name to his July dormant bulb email list. Carolyn’s Shade Garden. Visit this site! Check out the snowdrop listings and read the snowdrop postings on her blog. Even if you don’t order it’s always a great experience. Snowdrops are sent “in the green”, and you may recognize the name as a long time vendor at the Winterthur Bank to Bend snowdrop lectures. Odyssey Bulbs. A good selection of dry bulbs which always contains a couple really interesting things. Beware of all the other goodies which also fill the listing, you can never go wrong with adding a few corydalis to your snowdrop order. Far Reaches Farm. Potted snowdrops either in growth or dormant. A good source for an ‘off season’ fix of snowdrops. Brent and Becky. Dry bulbs from Holland. A nice selection of some of the more reasonably priced common types but be prepared for the possibility of mislabeled bulbs as these are massed produced and don’t have the usual obsessive gardener hovering overhead examining every tiny nuance. Rising up in the dark, depressing days of winter, snowdrops are always a hopeful sign of spring. Snowdrops are likely my favorite flower. There’s not much to them, they’re small and white and to see them usually involves being cold , but they’re still a favorite. Even growing up I knew where some of the best snowdrop patches were, and would find reasons to go to that park or down that street to make sure I got a dose of early spring. But it wasn’t much. A couple patches here and there were all I ever found, and the snowdrops I planted at home never did well. The dried up bulbs rarely grew, and the surviving bulbs never multiplied. Each spring we would excitedly count the same dozen or so flowers on scattered plants and still be excited. Things are a’changing though! In 2004, at the ripe old age of 35, after years of moving around the country and renting, I bought my first house. It was a complete dump (really not kidding, the realtor’s dog lifted his little leg on a doorframe inside the house and no one was offended…), but even alongside the massive renovation project I found time to plant a few snowdrops someone gave me, and later added a clump saved from the edge of a bulldozer rut. Surprisingly enough they grew, and surprisingly enough they grew well. 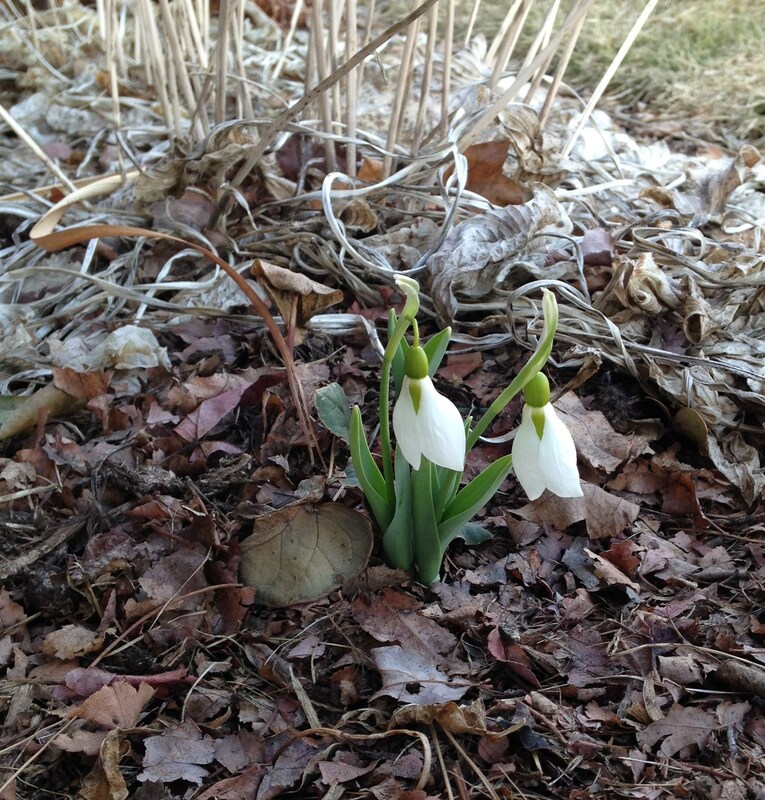 Not only did I finally have my own garden, but I also had one which snowdrops loved! A blurry 2008 picture of the first snowdrops to ever thrive for me. Galanthus nivalis, the most common and most perfect snowdrop. Snowdrops are not fussy flowers. Different types prefer different conditions, but for the most part full sun in spring, shade and not too much moisture in the summer, and a good soil will be enough. There’s more to it, but as a beginner I’m not about to make all kinds of suggestions which you could probably figure out yourself, plus there are much better references out there already. So now that I finally have a good spot to grow snowdrops, the next logical step is to go off the deep end and indulge in a little bit of a midlife crisis. The lover of snowdrops (a galanthophile) and a crazy obsession with snowdrops (galanthomania) naturally lead to wanting to collect a few ‘special’ ones of your own. You shouldn’t though. From the sensible side of a winter window the patches of white out in the cold, wet, late winter garden all look the same and to even consider crawling about in the icy mud to look up under the skirts at the markings of tiny white flowers is ridiculous. But ridiculous things happen and on the chance you do decide to collect a few snowdrops here’s some advice from another beginner. You don’t need one of everything. Just because someone named it doesn’t mean it needs to be in your garden, and I’m sure you realize this but try your hardest to stick to just one or two of each group. That means one older “doer” such as ‘Sam Arnott’, one double other than ‘Flore Pleno’ (which you should also have), one yellow, one of the large flowered ‘Mighty Atom’ types, one with green markings, one poculiform (all white with no green marked inner but extra outer petals instead), one……… Ok so this isn’t helpful, but only obsess about the ones which look distinctive when compared to what you already grow. I think some people who dip their toes into the named snowdrops world are a little disappointed by how they all look the same, and that’s because they do. Don’t get those. The catalog description may wax poetic on the nuances of the markings but unless they’re pink you may want to move on to the next one even if finding the next one involves waiting another year. It’s the same advice someone gave me a few years ago, good advice it was, better advice if I had listened to it. Galanthus ‘R.D. Nutt’. I’m not sure if that’s an official name, but I really liked this one when I saw it growing in Hitch Lyman’s garden. galanthus nivalis: The common snowdrop. This is the one you’re most likely to see spread throughout parks and woodlands and growing in large garden patches. Two leaves emerge side by side (usually compared to two hands praying) with the bloom in between. Leaves are on the thinner side, often lay flatter instead of upright, and the blooms often only have one green marking inside. In my experience these do well on heavier, fertile soils which don’t dry out much year round, and dry bulbs bought and planted in the fall often do not establish well. galanthus elwesii: The giant snowdrop. A variable group, but all have leaves that emerge one wrapped around the other. 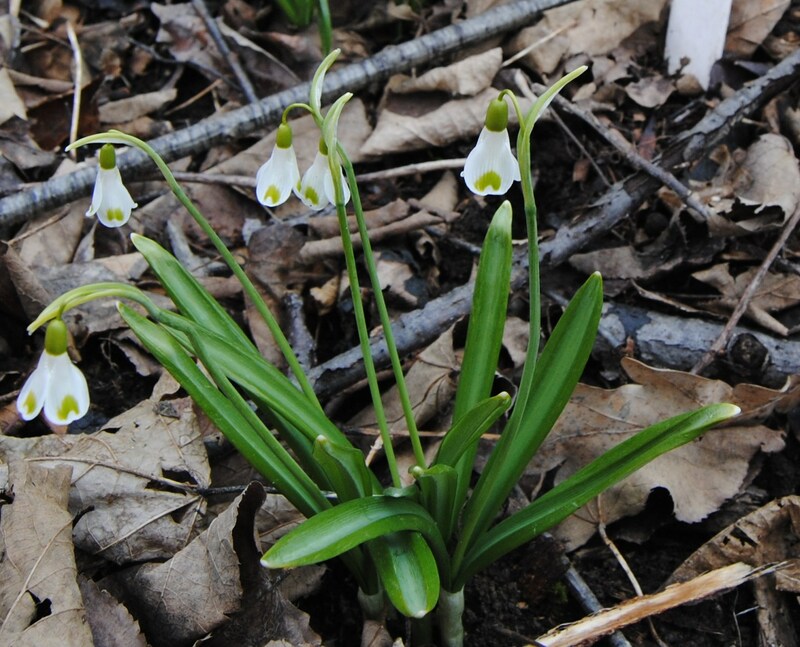 Different varieties may bloom in the fall, winter warm spells, or with the main snowdrop season, and the flowers usually show two green markings, one at the bottom of the inner petals, one on top. This is a good variety to buy in bulk since you’re likely to get a nice range and the bulbs handle dry storage better than other types. They seem to like a dryer, better draining soil, and don’t mind a little summer heat. 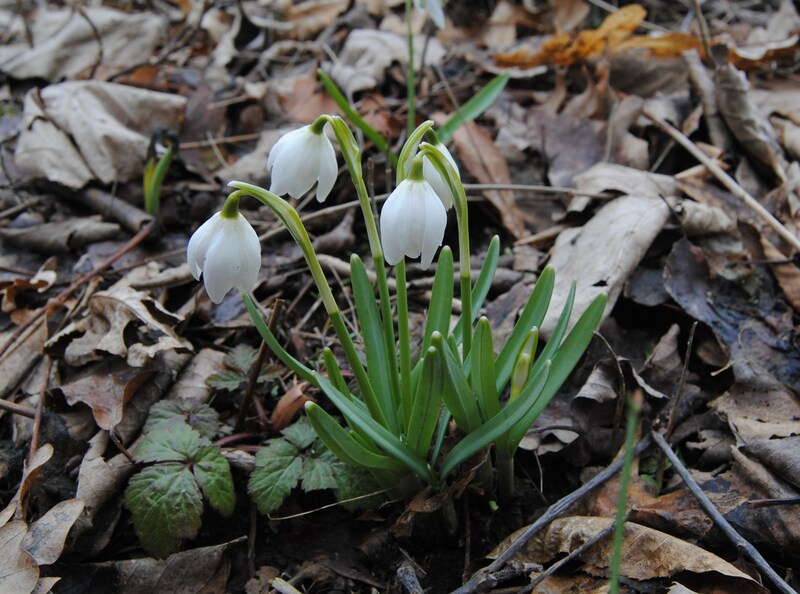 galanthus plicatus: The Crimean snowdrop. Believed to have been first grown by soldiers returning to England after the Crimean war, this snowdrop has folded or ridged (plicate) leaf edges. 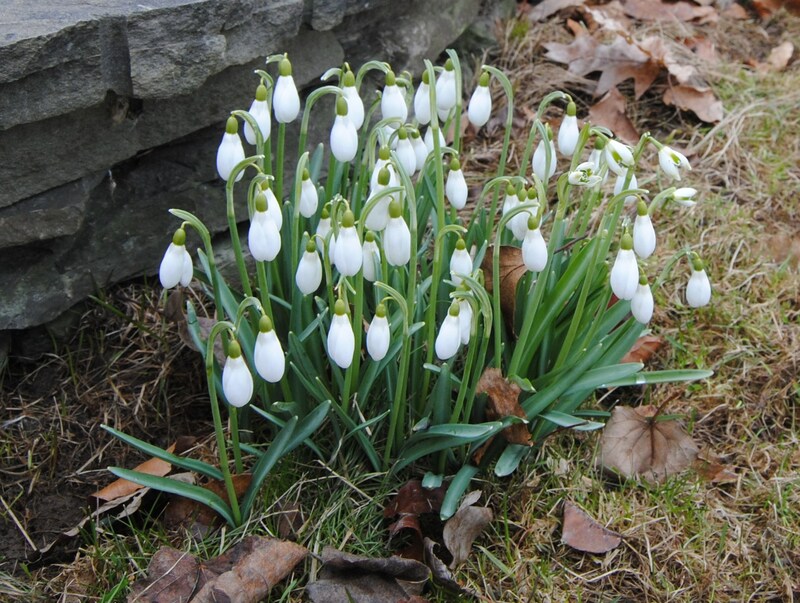 Some of my favorite snowdrops come from this strong growing group with large flowers, often two per bulb. They don’t seem to be very picky about growing conditions. Galanthus plicatus ‘Trymlet’. Most plicatus have the normal drop shaped flower but this one is inside out with the green marked inners repeated on the outer petals. The folded leaves are typical of this species. Other snowdrop species are less common in gardens, but even as a beginner I’ve run across g. gracilis (thinner gray leaves which have a distinct ‘corkscrew’ twist to them), g. woronowii (wider grass green leaves, a yellow version of which has the distinction of highest price paid -over $1,000- for a single bulb), and g. reginae-olgae (blooms in fall before the leaves show). And that’s all I have. Good luck in your snowdrop growing and I hope this was of some interest. If it’s not too much trouble I’d appreciate any and all comments and suggestions as I add to this page and update information. We’ll see where this obsession ends! This is a great, informative page, and yes, indeed, more than I ever thought I would read about snowdrops! You are a sick, sick man, Frank! : ) But they are lovely, and I think I may once again try some. I tried some bulbs a few years ago, but not a one came up. I think it was the weird winter when we had hardly any snow. Better this for a mid-life crisis than buying a super-expensive sports car, though, right? They are notoriously hard to start from dried bulbs. I’d blame the bulbs and not the winter. You’ll notice from my gravatar image that I am similarly sick. (Maybe not as sick as you?) This is a wonderful page. Thanks so much for creating it. I think I have only bookmarked one either blog page before under my ‘Gardening Info’ favourites! I’ve had a lot of lovely snowdrops in my time – some had warm associations with particularly special people. But we never moved when it was possible to dig them up. Now I am starting again and shocked by the prices. Someone, as we say in the UK ‘is having a ‘laff’! So far I only have G. nivalis, ‘Flore Pleno’, ‘Warham’ and ‘Sam Arnott’. I lost G. elwesii (your pics make me mourn all over) very quickly. You’ve made me aware again that I need to find a drier spot. Will try your links later. Cathy thanks, it means a lot to me that you liked the page. I think your current garden will really be perfect for sheets of snowdrops down in the grass by the river. I only wish I had as inspiring a spot to garden in! Maybe you can find a kindred spirit nearby who has more snowdrops than they know what to do with. A few gifted clumps to spread around would go such a long way in filling the empty corners of your garden on top of anything you purchase. It will happen in no time at all I’m sure! What a kind comment, Bittster. And thanks for your additional spot of inspiration. This is an excellent idea to bring all your info and thoughts on one plant onto one page! I have already looked at some of the links and discovered from a forum a snowdrop garden in the UK called Evenley that is pretty near my parents… will check if they have ever been there. Thanks Frank, and happy snowdrop season! I’m glad you found it useful! -although I put it together for mostly selfish reasons 😉 I kept forgetting which search results I had already looked at and which ones were new, so now it will hopefully be an easier process to find my favorites! 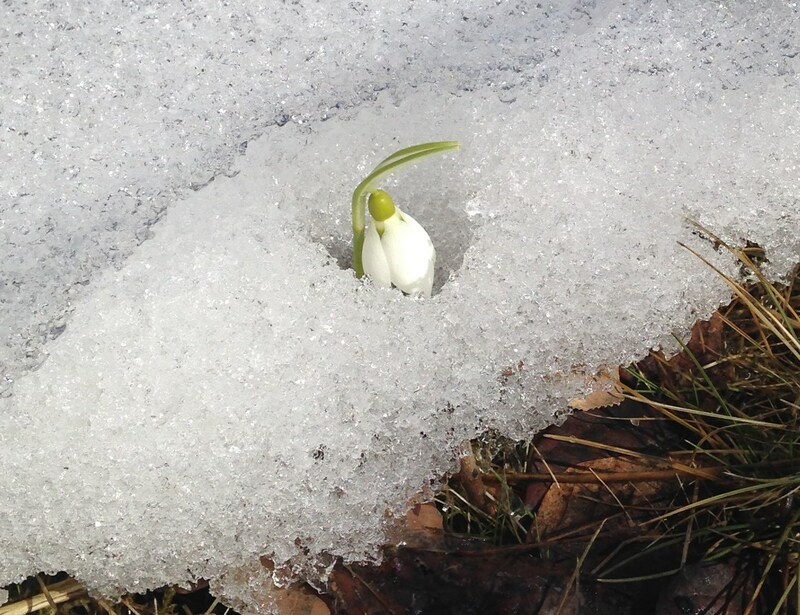 I’m putting together a spring snowdropping agenda as well. I think it’s going to be a fun way to start off the 2015 gardening season! This is really useful, thanks. I am just getting the bug having got very excited when I found a clump (well 3 really!) of snowdrops in my garden that had different markings. They turned out to be Elwesii. I have just ordered some more of these and a few Ikariae. What I really want are those Wasp ones – they are gorgeous. Might be hunting around. What a nice find! Even better when you know they’re doing well where they’re at and are already happy with your garden. I should see wasp blooming in my own garden this spring, it’s very exciting since I also think it’s one of the most interesting ones. Happy hunting! I hope it’s a little easier to find drops in your area than here! Thank you for linking to me and compiling all these sources. I knew North Hill had a website but did not know they had a blog! I will be slowly reading through all these sources. I am glad to see you got to Hitch’s place. What year was that? No, thank you for writing about your visit to Hitch’s! I looked at your posts quite a few times before my first visit and they were very helpful. I’ve gone the last two springs and am planning a return this season. 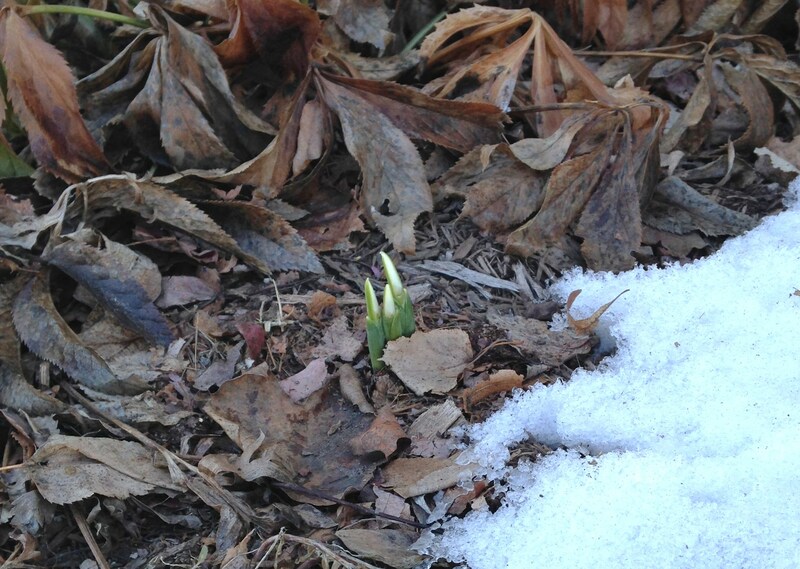 Warmer weather would be nice, but snowdrop season usually tends to run to the colder end of the thermometer…. And I thought I liked snowdrops! A genuinely readable and thorough addition to your blog offering a different perspective to the UK based sources more familiar to me. There’s also a wonderful photograph of Galanthus “Flocon de Neige”, a snowdrop I have not been able to acquire yet at a price I think is reasonable. Still …. I may take the plunge after seeing this. Just a thought on yellow snowdrops mentioned above. They may be expensive though look good in mass, albeit time is required to achieve that effect. “Trumps” is the most striking of all my snowdrops and it is getting cheaper in the UK at least. Thanks for the comment Ian. I have my first “Trumps” type snowdrop coming along and I’m excited to see it coming up quite nicely in its second year. It’s “The Wizard” and of course I’m excited to think it might be as striking as “Trumps”. Someone gave me a Flocon a few years ago and I am embarrassed to say it does not seem to like my garden. I have yet to see it do as well as I’ve seen it elsewhere, but gratefully it has not yet died. Maybe this year it will take off, but I guess unhappy expensive snowdrops are one of the downsides to galanthomania.